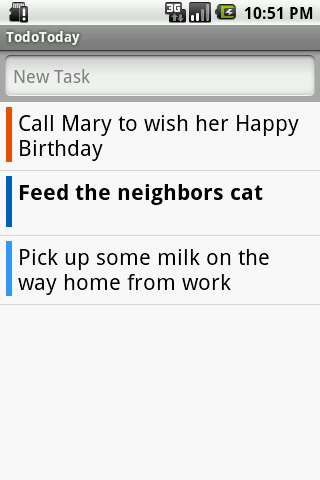 TodoToday v0.6.2 now brings support for adding new tasks to Remember The Milk using the "New Task" entry. Tasks are entered using the RTM "Smart Add" style, e.g. "Download TodoToday today !1 #android"
By default new tasks are added to the RTM Inbox unless a specific list name is provided e.g. #Personal. This release also has a number of under the hood changes to improve stability with background task fetching and some minor usability tweeks. Oh, and it would be absolutely brilliant if you could stack your operations somehow so I could complete tasks, for example, off-line. Font size options would be great too. Thanks for your feedback, we will consider your suggestions.